Where would you (currently) place yourself on the Map of Consciousness? Add your answer in the form below. The Map of Consciousness was put together by Dr David Hawkins. Click on the link to learn more about him and his work. “Over 250,000 muscle testing calibrations spanning 30 years of multiple research studies conducted by The Institute for Spiritual Research, Inc., Dr. Hawkins defined a range of values that correspond to levels of consciousness which include well-recognized attitudes and emotions. With a logarithmic scale of 1 to 1,000 and the Map of Consciousness® format that he developed, Dr. Hawkins explains the classification and characteristics of these energy fields to make them easily comprehensible and useful in daily life. It is important to realize that the calibration figures do not represent an arithmetic but a logarithmic progression. 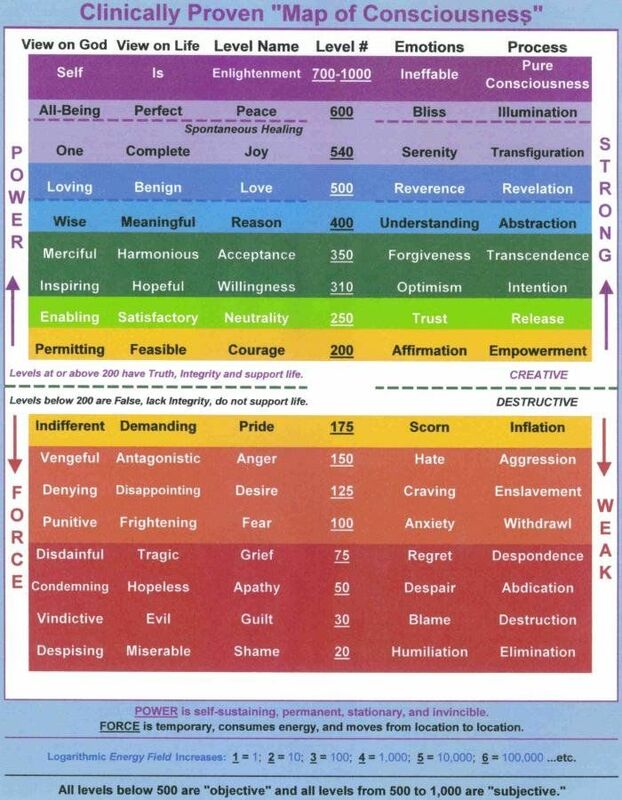 Thus, the level 300 is not twice the amplitude of 150; it is 300 to the tenth power. An increase of even a few points therefore represents a major advance in power.